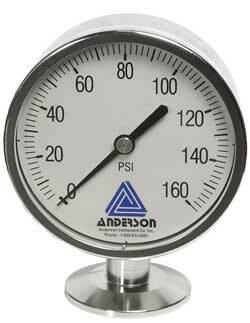 Anderson-Negele’s “EL” Gauge was designed with one criteria in mind – reliability. Sanitary pressure gauges are subjected to repeated process and environmental abuse in the form of vibration, pulsation, harsh cleaning chemicals, wide temperature and humidity swings. We’ve designed this product from the ground up to be the toughest, most reliable gauge for any sanitary application up to 1,000 psig. With over 30 years of experience building and repairing hundreds of thousands of gauges from a dozen different suppliers, we’ve identified and addressed all these key causes of premature failure in food, dairy, and beverage processing applications.